Coinciding with the 10th anniversary of Jura Australia, George Liakatos has been promoted to the position of MD as part of a wider restructure within the company. In a statement provided to Appliance Retailer, Liakatos was praised for his 15 year history with the company. “While it has been at times extremely challenging, even difficult, nothing has been more rewarding for George professionally than to see the brand grow to where it is today in Australia,” the statement said. “Therefore, it is with great excitement that we can inform you that George has now been appointed as Managing Director of Jura Australia. George has learnt a great deal about the industry, business and through his studies the importance of developing a brand. Nothing however can prepare you for the day to day insights you gain from doing the job. In his 15 years, George has learnt more about people and business than can ever be taught in a classroom. “I am proud of our achievements it would be remiss of me not to acknowledge the dedication and commitment of all our employees, without whom I would never have been afforded this incredible opportunity. I started working casually demonstrating the product, as the company grew I grew with it and I am here today as managing director,” Liakatos said. Liakatos was promoted to the role of national retail manager in 2009 after starting as a retail demonstrator in 2004, before working as account manager for Victoria, South Australia and Western Australia. 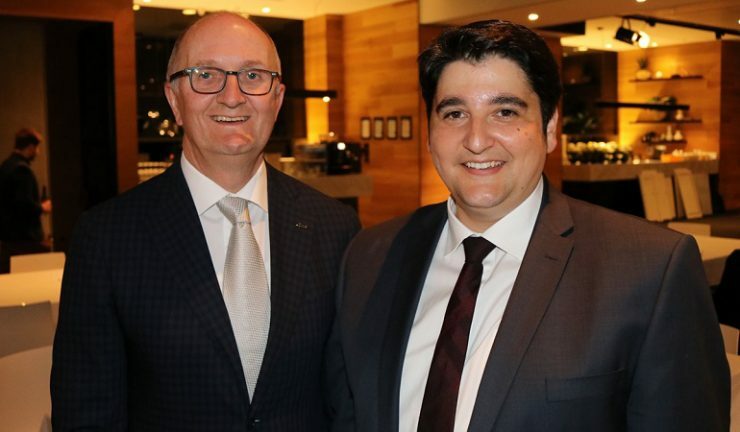 Jura global CEO, Emanuel Probst, was in Australia for the appointment and was excited to have Liakatos continue his role within the local subsidiary. “I really like it when someone works their way through the ranks to lead the company. If this is possible, then this is the best way for the future. You have a lot more respect from your employees, your customers and your partners. So I am very positive having George for the future. For the retailers, it means stability it means having a partner who you know and trust and if you have trust you can have good rapport and this is when you can really build a market,” Probst said. Jura Australia has also made some additional organisational changes will be made to support the sales division which Liakatos has managed as head of sales since 2011. “With strong growth comes an expanding sales team, and to manage such a diverse team Sylvia Occhipinti will be moving into a new role as Retail Manager. With over 10 years’ experience with Jura products plus her many years working in sales with Myer, David Jones and Clive Peters, Sylvia is more than equipped to take on this challenge. She acutely understands the needs and requirements of our retail partners and will be able to navigate our sales team towards future success. Along with her new role, Sylvia will continue to oversee the sales consultant and training program she has so passionately developed over the past five years,” the company said in a statement. Since returning to Jura in early 2017, Ann-Maree Macaulay has been managing Jura’s Sydney based Key Accounts. Through her stewardship she has realised strong growth within David Jones and Harvey Norman and as a result, Ann-Maree will now manage all our key accounts including Myer and JB Hi-Fi from 2018 onwards. Finally, Stefanie Ritter joined the Jura team in 2013 as Victorian Sales Manager. In early 201, she added our range of Professional Products to her portfolio. She successfully implemented and introduced the first workplace coffee machine, the WE8, through our retail channels in 2017 with great success. In 2018, she will focus exclusively on Professional Products and will be responsible for this division within our business.